Acroyoga is a combination of yoga, acrobatics and therapeutic arts. Practiced in pairs or small groups, acroyogis work and play together to create balances, sequences, flows and healing hang- outs. The poses deepen our connection with our own bodies at the same time as encouraging new qualities of contact with others. You don’t need to be super-flexi and strong, or a mega experienced yogi or acrobat before you start. Practicing acroyoga will build or improve all these and give your laughing muscles a good workout. Give it a go and start exercising trust, balance, and courage. There’s no better way to move out of your comfort zone than in a fun and friendly community, which is what you will find in acroyoga. Lets share some of this journey together. Bongo (aka Steve) and Sam have been enjoying Yoga, Acrobatics and Acroyoga since 2012 and have been teaching Acroyoga since 2015. In December 2018 they completed the VanCity Acro teacher training intensive. 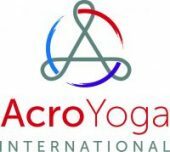 They are also affiliated with Acro Yoga International through their Jambassador programme. They travel and share their practice wherever they go, but are based mainly in the sunny seaside town of Aberystwyth (check our classes for details). Keep your eyes open for them out and about on a fair day – they are always happy to have company! Yoga of dragons – building communities of Acro Yoga and Yoga enthusiasts. Bongo and Sam Saville teach in Aberystwyth and elsewhere in West Wales to share the lovely combinations of shapes, stretches and moves one can make when playing with acrobatics and yoga. They run Acroyoga workshops worldwide.